Whatever the reason is this year I’m going over to the dark side (AKA giving up) and making tamale pies and casseroles. A traditional tamale is a dish that is made up of a marsa harina dough, meat, chilies, cheese and vegetables steamed or boiled in a wrapper. Since keeping it kosher means no mixing of the milk and meat I find myself often substituting the “fake” meat when I want to use cheese or sour cream or using real meat when I plan on eliminating the cheese and use the “fake” sour cream. I’m opting for utilizing a baking pan and lessening my frustration. As with all good recipe improvisations it’s about taking the best of what’s original and adding creativity. You can use dough or a corn bread mix and fill it with meat or keep it vegetarian and/or pareve. You can add salsa or not as your taste buds desire. The following recipes run the gamut from simple to OMG how many more ingredients are we going to be putting into this recipe? Have fun and a wonderful and delicious Cinco de Mayo (I love this holiday, no extra davening required and lots of eating). 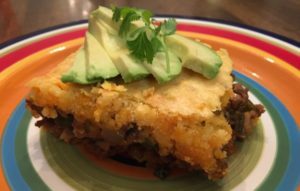 Note: A tamale pie usually has a “crust” on the bottom and a casserole has one on top the terms are used interchangeably (some might say indiscriminately). Preheat oven to 400. Grease an 8-inch baking dish with 1 tablespoon oil and set it aside. Heat the remaining olive oil in a skillet. Cook the turkey, onions, green peppers, and garlic until the turkey is cooked through. Drain the liquid off and then add the cumin, beans, tomatoes and hot sauce. Mix and bring the mixture to a boil. Reduce to a simmer and cook for 5 to 6 minutes. Remove from the heat and add the pareve sour cream and cilantro. Spread the meat into the prepared baking dish and set it aside. In a bowl combine the cornbread mix with the nondairy substitute and egg. Spread the batter over the meat mixture. Bake for 20 to 25 minutes until the top is golden. Remove from the oven and let sit for 5 to 10 minutes before serving. Serve 6 to 8. Preheat the oven to 375. Heat the oil in a large skillet over medium heat, then add the garlic, celery and onion and saute until the onion softens and starts to color, about 5-7 minutes. Add the bell pepper and saute until it softens, about 5 minutes. Sprinkle with the chili powder, cumin, and cinnamon, and keep stirring to toast the spices about 2 minutes. Stir in the tomato sauce, water, drained and rinsed black beans, chilies, corn, and salt. Bring the mixture to a boil, then remove it from the heat and stir in the chopped cilantro or parsley. Pour the black bean mixture into a shallow 9X9 baking dish. Sprinkle the cheese over the top and set aside. In a saucepan whisk together the water, milk, and cornmeal. Bring the mixture to a boil, whisking continuously. As it thickens and starts to pull away from the sides of the pan (5 to 7 minutes.) take the pan off the heat and whisk in the sugar, salt, baking powder, and then the beaten egg. Spoon the corn meal topping over the bean mixture and spread it evenly over the top. Dot the pieces of butter over the top. Place the pan on a cookie sheet (to catch any drips).Bake for 45 minutes. Let cool for 10 minutes before cutting. Serves 6.